There are places you go to eat and leave a large sum of money, but feel it has been worth every penny. 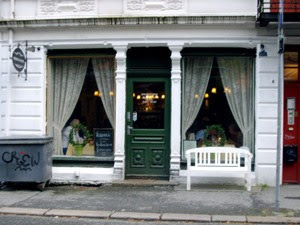 This was certainly the case at Spisekroken, a small intimate restaurant at Nordnes in Bergen with a continental/french style cuisine. 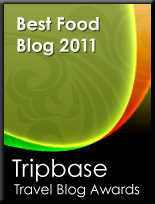 It lacked many of the features of a true michelin star restaurant, but the food was truly at the same level! Spisekroken is tucked away in Klostergaten, a quite street at Nordnes, a quaint old part of Bergen and in walking distance from the city centre. It may be a little difficult to find, as this area of Bergen has a large number of narrow streets crisscrossing along the steep hillsides. It is an ultimate romantic place to eat your dinner. From the outside it looks like a small french bistro, and when you enter, you're not disappointed. The restaurant is small and intimate and you may get a table at ground level or you enjoy the meal in the basement. 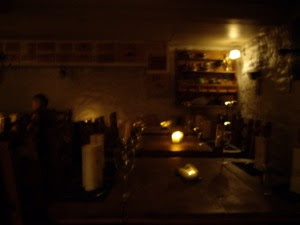 This blurred picture is from the basement, where we had our dinner. Rustic - with large wooden tables and comfortable chairs in a room with white decorated stone walls and soft lighting created the perfect setting for a very good dinner ahead. We paid a little over €175 for two entrees, main courses, and desserts, one glass of chablis, a bottle of red wine and coffee. This is a decent sum of money, but you left completely convinced that it was worth every penny. This as the quality of what was served was superb!! Great service. We did not wait long to served during the dinner. The waiters gave good advice on the meal and on the wine list. 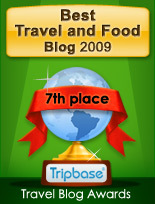 On the restaurants website you find a great English menu, so I am convinced foreigner visitors would get equally good service as we did from the professional staff. The menu has 3-4 entrees, half a dozen main courses, light meals and desserts. You may also order 5 or 6 course dinners, the latter with wine included from €68 to 118. As I have visited the restaurant website, it is obvious that the change their menus quite often, as our choice was not longer on the menu. 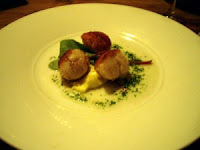 I ordered fried scallops with rucola, pesto and wasabi aïoli. Perfectly prepared, tender, slightly undercooked, and the aïoli and wasabi combination - very untraditional. My nephew picked another intriguing entree, gravad venison with cognac, and apple compote. Scandinavians usually make gravlax, thin slices of salmon cured in salt, sugar, and dill. 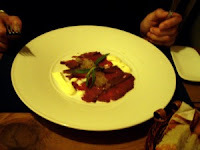 Here they had substituted the salmon with fine delicate slices of raw venison fillet, and added cognac. I was so curious and was allowed to taste a slice and it was exquisite. A main course to die for!! We both decided on the same main course. Gourmet veal with fried foi gras, potato terrine and oxe tail sauce. Rarely you are left speechless, when you tuck into a good meal. Here we were. 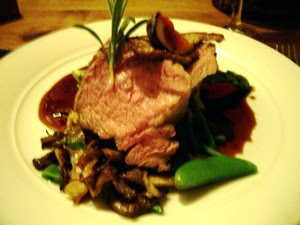 The veal was succulent and exceptionally tender. The foi gras was left on the side of the plate to the end and was a great finale. The sauce - sweet, salty, and acidity perfectly balanced. The potato terrine was perfectly seasoned and the vegetables - al dente with a crunch. Here it is hard to be a critic, as this meal was perfect!! White chocolate mousse with fresh fruits and champagne jelly. 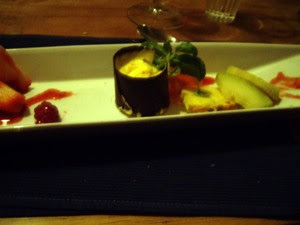 Served in a small cylindre of dark chocolate with slices of strawberries, pineapple, and melon. The chocolate mousse, with intense honey-like taste of white chocolate balanced by the fruity acidity of the champagne jelly and fresh fruits. I had a glass of my favourite white wine to the scallops. The wines from Chablis in Burgundy are the few white wines I truly enjoy, and its dry, mineral character was great to the seafood. 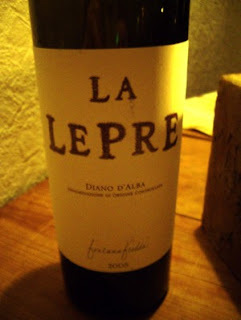 The waiter guided us to a bottle of la Lepre Dolcetto Diano d'alba 2005 for our main course. This in spite of the fact that I avoid Italian wines to red meat as I find them too fruity, lacking the necessary richness as you find for example in Spanish, or South African wines. This wine from Piemonte is made from 100% dolcetto grapes, and had the necessary richness to balance the veal. Much fruit and spices. Perfect!! This is certainly a wine to buy again, in spite of its price tag at the Norwegian vinmonpolet- a little over €20 a bottle. And we ended the meal with coffee, before we left our table, very satisfied. Truly exceptional and highly recommended at Nordnes! !